Hob Nob Farm, the home of Jack and Elna Gambill. 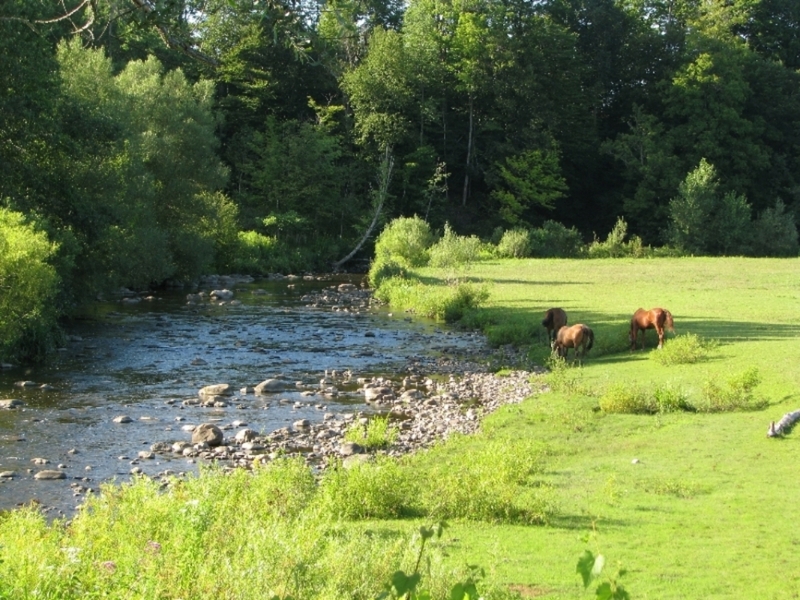 We are located in a picturesque area of upstate New York, just north of Utica, off Route 12 North in South Trenton. Hob Nob Farm is a full service facility on over 100 beautiful acres. We provide quality services at reasonable rates. Hob Nob Farm provides a safe, family atmosphere for everyone's enjoyment, horse and horse enthusiast alike. We welcome boarding. We are open 24 hours, 7 days a week. 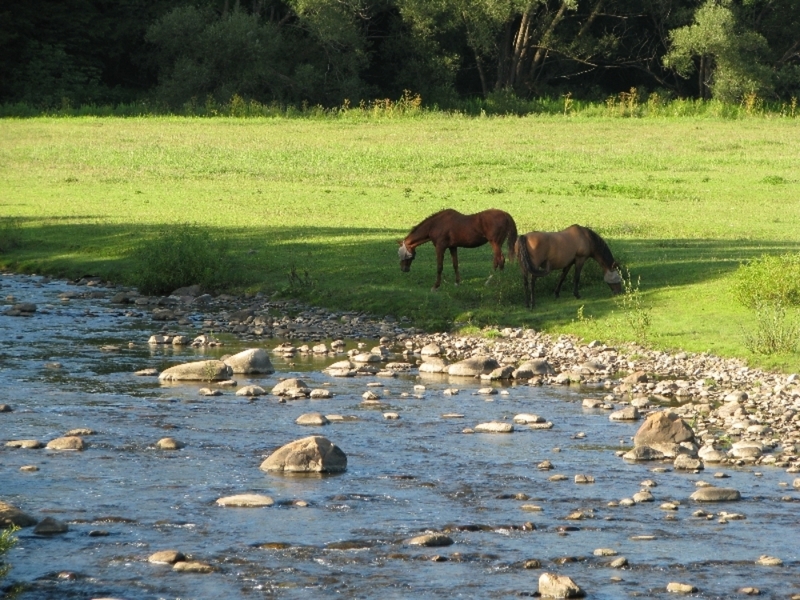 Our barn is always open for you and your horse's enjoyment. Just some of our amenities are listed below. Fun and Games at Hob Nob Farm. Some of the horses are learning to play soccer with our Big Game Ball! But the fun doesn't stop there. 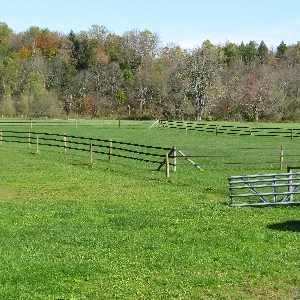 We offer full-service boarding (year 'round) with heated water buckets during winter months, large barn fans during summer months, daily stall cleaning with ample and multiple turn out pastures, daily feeding, 1st or 2nd cutting hay, soft shavings for bedding (or pellets for add'l fee), window in stalls, structured worming program, large salt blocks in every turn out pasture, several round pens, large picturesque outdoor arena, spacious indoor arena, miles of trails, water buckets emptied every other day (sooner if needed), and if that's not enough, we offer cold bottled water from the frig., microwave oven and a coffee maker, so whatever your riding pleasure Hob Nob Horse Farm has it all. (supplements and certain other services such as vet, farrier, worm medicine, and alternative feeds are the owners responsibility and expense but may be made available through us for an additional fee). On premise horse leasing from beginner to advanced. ALL this and MORE for just $290/month for year-round boarding or, $340/month for winter board which does include all the amenities. Our spacious indoor arena is here for year 'round riding. It incorporates a supple sand base, with tons of activities for horse and rider. Equipped with mounting block (if needed), stereo/radio/cd player as well as large soccer ball, tarps, cones, cavalletties, and barrels. This is our outdoor arena. From Spring to Fall our spacious outdoor arena is setup for simple pleasures of walking, trotting, loping or, Hunter/Pace if that is your preference. We have barrels, jumps, obstacle course and tons of fun. So no matter what your riding style, Hob Nob has it! Our spacious heated tack room has ameneties for everyone. Whether you'd like a hot cup of tea or coffee, popcorn in the microwave, or just a cold bottle of water from the frig., the Barn Management Team provides convenience and comfort for both horse and rider! Come, sit, drink and be happy! Please call for information about our riding lessons. We offer both English and Western lessons and specialize in Balanced Riding. We have horses available for all riding levels. We have many leasing options. Please call to learn about our horse leasing programs. If leasing is of interest we are happy to find a program to meet your needs.